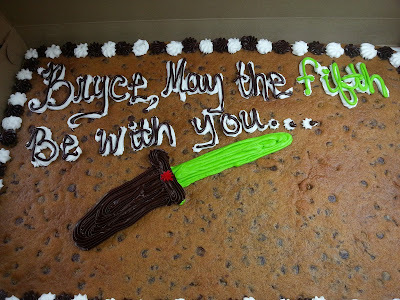 Bryce asked for a Star Wars party for his 5th birthday and that is just what he got. I had so much fun with this party theme. I can't take credit for all the ideas because I got many of them from Pinterest, but I did come up with some of them on my own. First I'll start with the invitations. I was hoping to avoid making invitations this year because it does take some time, but I was NOT impressed at all with any of the invitations I found online. They were either super cheesy or ridiculously expensive. I did find one really cool invite in the shape of a light saber (CLICK HERE) that I thought about copying, but after more thought decided it would be a little too time consuming and costly. In the end I did make the invitations. They were simple, but turned out really cute. Other than the stamps, I didn't spend any money on the invites because I already had all the supplies I used for them. I downloaded a free Star Wars font and the black/white lightsaber image from online. After printing and assembling the invites I added the glitter to the lightsabers. I had invites with blue, red or green lightsabers. I ordered the plates, napkins, table covers and wall murals from Party City. I never order a ton of the themed party supplies because they are always so expensive. Usually I order a few packages each and I head to the dollar store and buy solid plates/napkins to mix in. This saves a lot of money! I ordered Sydney's soccer stuff and Bryce's Star Wars stuff at the same time so I ended up getting free shipping and a 20% discount. SWEET! For the other decorations I used all of our Star Wars toys along with a lamp and painting I did for Bryce's room. Bryce and the girls have collected quite a few Star Wars paraphernalia over the last few years so I had plenty of stuff to decorate with. I already had the happy birthday sign and streamers and my mom picked up the star balloons from the dollar store. I forgot to take pictures of the silver and black lanterns that were hanging throughout the kitchen. These were supposed to look like planets. Not sure if they did, but it still looked cool. I ordered the lanterns from Party City as well and they can be used for future parties. The Vader lamp I painted. The lamp was originally white so I painted it black with a satin spray paint. I also bought a new lamp shade and then painted it black. I googled Vader's chest plate to copy. There are several different versions so I went with the colors that majority of the Star Wars "nerds" (we love you) use for their own costumes. Bryan sketched the face onto the shade for me and I went over it with a silver sharpie marker. Bam...new lamp for Bryce's room and also a nice decoration for the party! I also painted this sign to go in Bryce's room (haven't hung it yet) so it served as a good party decoration too. I printed the words and then traced the letters onto the wood by pressing really hard. It left a nice indention into the wood so from there I traced with a black sharpie marker and then filled in with acrylic craft paint. Really it was a dessert table and I had a lot of fun planning this one. There were some amazing ideas online for Star Wars food and dessert items. We went easy on the food and ordered pizza so no one had to man the grill during the party. This makes the hubs and my dad very happy. :) So since I didn't get creative with the actual food I thought it would be fun to have lots of Star Wars goodies to eat. Chewie's Chocolate Crispies = Rice Krispie Treats covered in chocolate. My motto is everything tastes better dipped in chocolate! Blaster Brownies (out of focus) = chocolate brownies with chocolate frosting and crushed M&M's on top. Add the frosting when the brownies come out of the oven so it melts. The M&M's then set into the melted frosting. Place in the fridge to set. These are YUMMY! Ewok Treats = Star Wars themed gummie snacks. I found these in medium sized bags at Walmart near the check out counters. I forgot the sign for my Dark Side cupcakes, but they were chocolate on chocolate...of course! Cupcake cups and toppers from Party City. Yoda Soda = a carton of lime sherbet and two 2 liters of Sprite. It was THAT easy and so delicious. May The Fifth Be With You birthday cake from the Cookie Company. The above cake was the 2nd cake. Let's take a moment to appreciate the first cake they gave me. I asked for a green light saber along with writing May the FIFTH be with you. The cake decorator was clearly not familiar with Star Wars because that my friends does not look like a light saber. This is a family blog so I won't say what my first thought was and we can leave it at that. I had a slight stress out once I got back in the car with the cake, but my husband was a doll and took the cake back to ask for another. Thankfully the manager at the Cookie Company agreed and quickly made us another cake. WHEW! The girls each got a pinata on their 5th birthday so I did the same for Bryce. Party City sells an actual Vader head pinata, but it's one of those pull string pinatas which is boring! I wanted something the kids could swing at because let's face it...hitting something with a stick is way more fun than pulling a string. I found a few blogs that made their own Death Star pinatas, but I was not feeling THAT crafty so I bought a star shaped pinata dubbed the Death Star. My plan was to make a few brown Jedi robes for the kids to wear while they hit the Death Star, but that was one of those things I decided I didn't need to stress myself out over. I tend to do that. I am happy to report that no children were knocked in the head with the stick although we did have a few close calls! For party favors I snagged the pool noodle lightsaber idea from Pinterest. There are dozens of blogs that have done their own version of these, some more elaborate than others. I used red, green and blue noodles that I bought from the dollar store and black, silver and gold duct tape. I cut each noodle in half with a bread knife since its serrated...you slice right through. I then used the duct tape to make the hilt (handles) on each lightsaber different because no two lightsabers are the same. I had a lot of fun making these. Oh and for the record...cutting a circle out of duct tape is a talent people because it's not easy to do. I had murals (Party City) of the good guys and bad guys hanging on the wall. I was hoping to take pictures of each kid in front of one of them with their lightsaber, but I completely forgot about it in the midst of the party fun so I only got pictures of our kids. The kids are having a good time playing with these lightsabers. And by kids I also mean my dad since he took one home with him to use on the kids when they come over. Ha! And last but not least...the infamous birthday party CD. The birthday CD has become a tradition with our kids. They each have a play list for their parties that we hand out to guests as they leave. I think we started doing this on Sydney's 3rd birthday and we have done it for every party since then. Months before the kids party they start asking what songs are going to be on their birthday CD. We are a music loving family so the kids really get into this and have a say in what songs go on their CD. I try to theme the music with the party, which isn't easy sometimes. Thanks for reading and feel free to Pin or borrow any of the above ideas or share any ideas you have with me. Our oldest said she might want a Star Wars party next year so I'm definitely open to new ideas and suggestions.